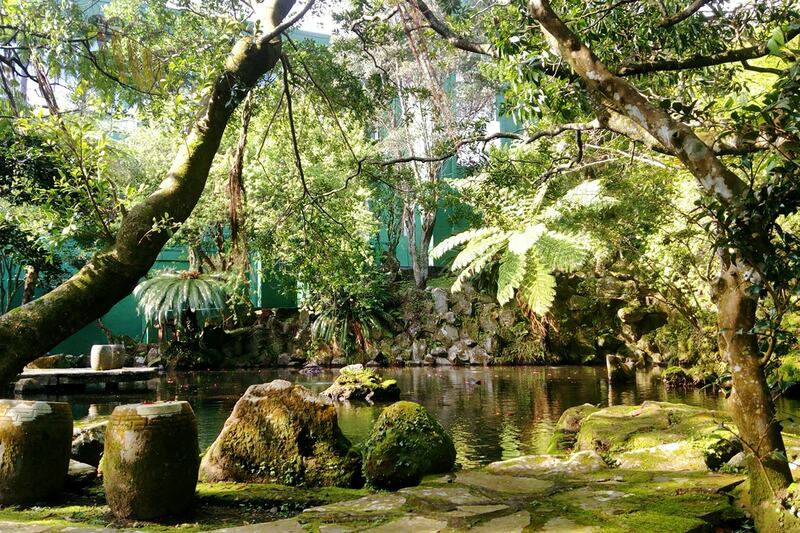 Yangming House was a hot-spring villa during Japanese occupation of Taiwan. Late president Chiang Kai-Shek loved the beautiful scenery here and built Zhongxing Hotel to accommodate foreign guests and to spend summer; the hotel was later reconstructed as Yangming House. As Yangming Villa and Zhongshan Building were constructed nearby, important government officials often gathered here, making Yangming Mountain (Yangmingshan) the decision center for the government. After the death of Chiang in 1975, historical KMT documents were moved from Li Yuan in Caotun, Nantou to Yangming Mountain (Yangmingshan) for exhibition in memory of Dr. Sun Yat-Sen and late president Chiang Kai-Shek. As late president Chiang had respected and admired Mr. Wang Yang Ming, the building was named Yang Ming In 1996; KMT donated the Academy to the Ministry of Interior, providing a recreational and educational space for Taipei citizens. Yangming House is a 2-story, traditional Chinese building. The theater, VIP rooms, offices, and restaurant are on the first floor. The second floor was used by Mr. and Mrs. Chiang and their paintings and some personal belongings can still be found here. On the wall of Chiang bedroom, there is a wedding photo taken in Shanghai on December 1, 1927. In addition, there are other photos of the couple visiting different places. Nat'l Hwy 1 → Exit at the Taipei Interchange → Prov. Hwy 2B → Bailing Bridge → Zhongzheng Rd. → Prov. Hwy 2A → Yantou Hwy → Shamao Rd. → Hushan Rd. Sec. 1 → Zhongxing Rd. Nat'l Hwy 3 → Exit at the Zhonghe Interchange → Prov. Hwy 64 → Prov. Hwy 106A → Prov. Hwy 3 → Huan River Expressway → Minzu W. Rd. → Prov. Hwy 2B → Bailing Bridge → Zhongzheng Rd. → Prov. Hwy 2A → Yantou Hwy → Shamao Rd. → Hushan Rd. Sec. 1 → Zhongxing Rd.